Happy Friday everyone. Another week is winding down, and it did fly by for me. Maybe it did for you too. Today I am off on a teacher field trip. I'm going to see some flowers and green and some exotic plants. I am so excited, and will tell you more in another post. But today I have a spring sketch for Rosie's challenge at Art Journal Journey Rosie picked spring as her challenge, and I am loving the opportunity to do some spring pages. Today my page is something that is fairly unique to northeast area of North America-maple sugaring. When I drive around at this time of year I pass people who have buckets hanging off their sugar maple trees. The trees get tapped and the sap runs into the buckets. Then the excess liquid is boiled down and voila, you have maple syrup. In case you are interested, back in 2016 I did a T Day post about maple sugaring which you can read here T Stands for Making Maple Syrup. We have a sugar shack down the road from our house. And maple syrup is a "healthy" sugar source, as I recently found out. So to make my journal page I first gessoed the paper. Then I painted the trees (I need a little more tree practice I think-they look a little stubby on top) and the ground. Then I added the buckets. Finally I used a watercolor crayon to color the sky. I gave the colored background a water wash, and while it was still wet I did a bit of rubbing with a paper towel which created this cool sky effect! Maple surgaring a sign of Spring, for sure. I didn't know those facts about maple syrup. Good to know. Enjoy your field trip. Looks like you'll have a nice weather day for an outing. What a fantastic painting of those sugar maple trees! I love the colors and textures and those lovely little buckets - first I thought of nesting boxes...lol. Great colors Erika and super artsy shading!!! Your painting style is unique and very artsy!You are so talented! Hope your teacher field trip was nice, I am looking forward to seeing photos soon- and I wish you a very happy start of the weekend my friend! Thank you for another wonderful entry linked to Rosie's theme.♥♥♥ Her Art Journaling muse is gone totally I fear -lol. I didn't get her in the mood of art journaling at all - I failed! No snow here - but they now forecast it for this weekend! They are very generous with their weather forecasts! Now they tell us about a low pressure area from Italy bringing snow...we will see. It's still toooo cold much tooo cold! What a cool blog!! Thanks for stopping by, and taking the time to comment!! I see you take tea with Dr. E on Tuesdays and you are a long term blogger!! Nice to meet up with you here!! Thanks again!! 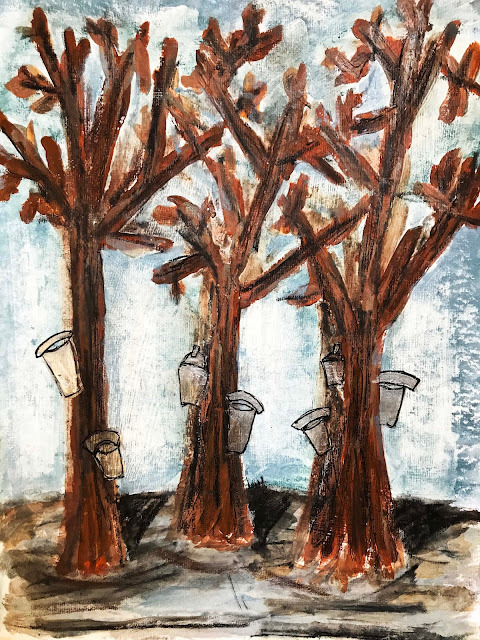 A great page journal page with the trees and their collection pails. They were interesting facts about the Maple syrup as well. Sorry this is brief. I'm having keyboard problems. What a fabulous painting of the maple gathering. Perfect for AJJ, too. Thanks for linking. BTW, I love your spring inspired banner. Just like you have maple trees you tap, we have oil we pump up from beneath the ground. And yes, this is just the beginning of this museum so there will be more to come, especially since I got such a positive response to it. Your painting of these buckets hanging off the sugar maple trees is gorgeous! A very interesting picture and thanks for the added text! Now I'll look to your link about making maple syrup, I am curious! This might be one of my favorites of yours, Erika. I love sap buckets (and their end product). In fact, one of my waste baskets is an old metal sap bucket. We have a maple syrup day at our arboretum here -- I need to find when it is! Sounds like your field trip was fun and flowery -- can't wait to hear more! Great journal page and info here and on your link Erika which I didn't know about - thanks for that. (the pancake looked yummy too).